When living the expat life in exotic places, one of my favorite things to do is have lunch or dinner with friends in interesting local eateries, the sort of establishments you might not find in, say, Holland, or America. There are reasons for that, of course, but let’s not go into that. 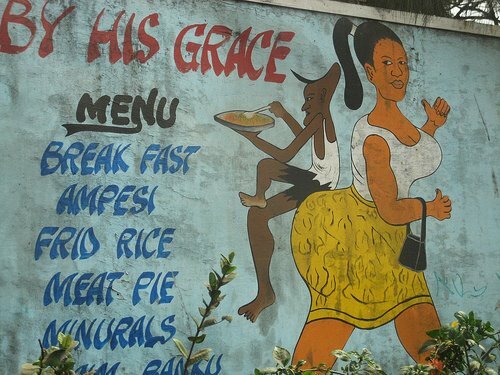 For years my husband and I lived in Accra, the capital of Ghana in West Africa, a town that abounds in fun places to eat. Just look at this photo by Koranteng Ofosu-Amaah and you know what I mean. So here’s a tale of one of my evenings out with friends. As all expats know, when you live in foreign lands it’s best not to cling too diligently to the rules and manners your mama taught you. QUESTION: As an expat living in a foreign country, what local food do you, or did you, enjoy eating there? @ Anonymous, it is what it is. Our Ghanaian friend, a psychologist, started the discussion. Life everywhere has many parts. Ah, yes. West Africa, so of course discussions of juju, mystics and dark, titilating mysteries fo all sorts. What else, after all, do people in this country of many millions discuss? Certainly not politics, sports, the arts that anyone else in the world discusses. Please don’t let objectivity or general good sense hold you back from shooting forth impressive stereotypes. I stumbled, fell into your blog and I can’t get up to leave! Wow. You are much more adventurous than I will ever be! What a fun piece. I hate chicken feet. I hate how it looks when people eat it. And honestly, there is so little meat on it, I don’t why Koreans even bother! Love this portrait of eating out.. and what a great restaurant – yam with palava sauce… Love it! In China I enjoyed eating spicy tofu. Here in Sweden, they do good food, but often with creamy sauces that I can’t eat… They do a wonderful Easter bun called a semla and delicious cinammon swirls too! YEah, isnt Ghana wonderful. Ill be sure to check out this space more often in the future. And your story has inspired me to tell what I once went through in search for a “washroom” in a Ghanaian restaurant…coming soon on my blog. Great write up! As a Canadian Accra resident I have been many times to Blue Gate – even with the gang you refer to!!! I always make sure to pee before I go there though…. Nothing beat a cold star and a plate of hot grilled tilapia with veggies and hot pepper – and no forks or knives of course!!!! Thanks for the compliment! I did and do love writing these stories. The vegetables were carrots, cabbage and tomatoes, found the world over, I think! Once again a beautifully told story. I expected something weird to happen in the bathroom though. You built the tension up and I thought, “Oh my, what now.” The fish sounds delicious. I was wondering what kind of vegetable you had though? intixpatr, I love Middle Eastern food. Just received a big bag of sumac and another one of za’atar from Palestine to use in my own cooking — do you use them in Kuwait? Oops! We eat often in the souks, grilled meat or fish, appetizers made of fresh eggplant and garbanzo beans or parsley, and the most wonderful bread in the world. LLLOOOLLL! Hey! Running water! Aren’t jean skirts for wiping your hands on after washing? It’s all good! Your meal sounds fabulous, fresh food, freshly prepared and great conversation . . . 🙂 You are leading a fabulous life.